Communication breakdown: Einstein and Bohr were two giant pillars of 20th century physics. However, their communication reached an impasse towards the end of their career in resolving the differences between their theories: relativity and quantum mechanics. A professor, Hermann Weyl, who was at Princeton when both Einstein and Bohr were there, decided to hold a party so that the two can start talking to each other. During the party, Bohr and his students gathered in one corner of the room and Einstein and his at the other. It just didn’t work. Did this communication breakdown impact the creative momentum in physics? David Bohm and David Peat, authors of “Science, order and creativity”, feel that the answer is “yes”. They feel that physics would have progressed faster if Einstein & Bohr had had better communication. Communication, for most of us, is an afterthought i.e. idea comes first and then you communicate it. Bohm-Peat run this logic backwards. They feel that communication plays an important role in how you develop a creative insight. Let’s see how. Creative insight: How does creative insight develop? Bohm-Peat illustrate the concept using the story of deaf & blind Helen Keller and her teacher Anne Sullivan. When Sullivan came to teach Helen, she met a “wild animal”. Over a period, Sullivan could make Helen more disciplined. However, she knew that that wasn’t the goal. The main problem was: Helen didn’t have the concept: “everything has a name”. Hence, there was no language to communicate. So Sullivan starts playing “it has a name” game with Helen (e.g. see the movie The Miracle Worker, jump to 1:19:30). Whenever she would come in contact with an object – say, water – in bath tub, tap water, stream, water-pump Sullivan would finger-spell the word “water” for Helen. For Helen these were all disparate experiences. Until one day she realizes that there is something common among all these experiences which is called “water” (1:39:05). That was a creative insight. Thus a creative insight involves establishing connections among two or more unconnected elements in the memory, each forming a new pattern. In Helen's case it involved connecting various memories involving water to the name "water". For Einstein it was connecting the concept of mass to that of energy through an equation, E = mc2. What hampers creative insights? As we form multiple concepts in our mind, over a period the patterns become rigid beliefs. To see new patterns, sometimes we need to let go of old patterns. The more deeply embedded the old patterns are, the more difficult it becomes to form the new ones. The biggest difficulty is that we are not even aware of the deeply embedded patterns. Bohm-Peat call it the tacit infrastructure of our mind. A beautiful illustration of how this happens is depicted in the movie “The 12 angry men”. The plot revolves around a meeting in a closed room where 12 jurors discuss their opinions to arrive at a verdict for a murder case. Deeply embedded patterns in the form of racial prejudices, stereotypes associated with broken families, slum people etc prevent these men from seeing alternate views of reality. They had reached their verdict even before they arrived in the room and they weren’t ready to budge. So what do we do? A breakthrough in the movie happens when communication starts flowing among a few of the men. How? As they start arguing, there are moments when attention gets shifted from their position (of say, a “guilty” verdict) to clarifying assumptions behind their opinion. For example, in one scene one juror says, “Let’s talk about the knife the boy used to kill his father” (0:23:39) and another one says, “In fact, I would like to look at it again.” And suddenly the attention shifts to relooking at the knife, where it was purchased, who had seen the boy with the knife etc. This process eventually leads them to see that their so-called strong beliefs are on a slippery ground. Dialogue: The process of clarifying assumptions during a discussion is also called a dialogue. Nobody can predict how fast physics might have progressed if Einstein and Bohr had continued to have a dialogue. However, it is not very difficult to check if we are spending any time in clarifying assumptions during our discussions. It might suddenly open a door for creating a totally new connection between two unconnected concepts – just like Helen Keller. 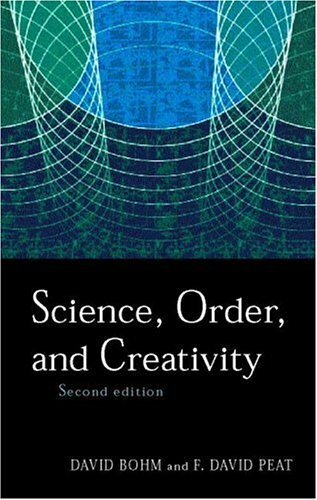 Note: “Science, order and creativity” is not a light reading. However, I feel its first three chapters are thought provoking and easier to understand. I would like to thank my friend Rahul Abhyankar for recommending the movie “12 Angry Men” to me. Why did Prof. George Sudarshan say, “I am quite good at deceiving myself”?